These videos show off some of the Snapdragon 855's flagship features, from intelligent audio filtering to 4K HDR video capture. Qualcomm’s new Snapdragon 855 mobile processor offers a ton of new features that could be potentially enabled on next-generation smartphones—almost too many to list. But we managed to see some of the best in action. 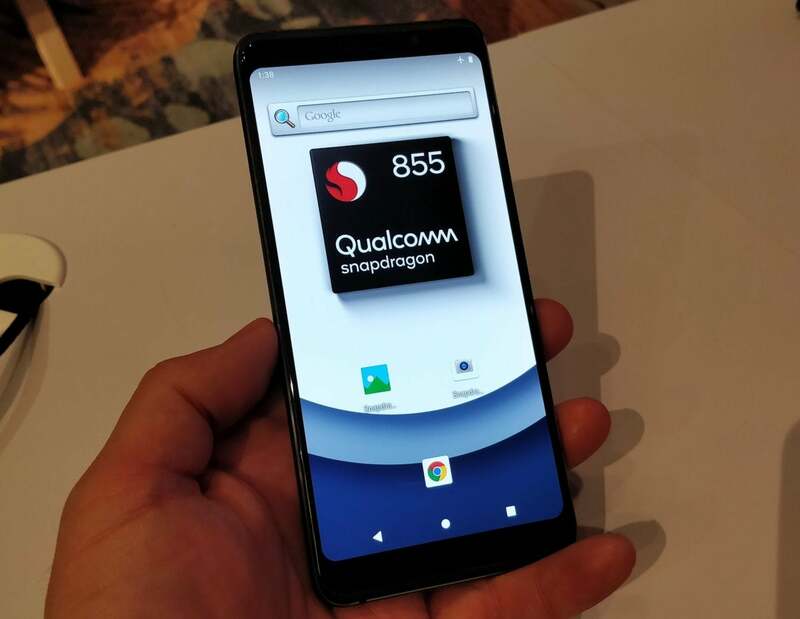 After Qualcomm finished announcing the Snapdragon 855, the company opened a pair of demo rooms showing some of the 855’s flagship features. Through PCWorld’s video team didn’t make it to the event, I was able to record video demonstrating some of the new capabilities of the mobile chip, including improved battery life and gaming performance, intelligent audio filtering, and 4K recording with HDR. They all ran on prototype phones with the Snapdragon 855 chip inside. Qualcomm talked quite a bit about the Snapdragon 855’s performance during the processor’s reveal, but not so much about battery life. But in this demo, the company configured two identical phones—one equipped with the new chip, and one with the last-generation Sanpdragon 845. Both phones are running a test that estimates their projected battery life. In one test, an Instagram-like app is playing; in the other, both phones are running Player Unknown: Battlegrounds. The Snapdragon 855 comes out comfortably ahead in all situations. There aren’t too many apps that can truly test a smartphone processor’s graphics capabilities, though PUBG and Fortnite probably fit the bill. Instead, Qualcomm used Asphalt 8, a traditional high-speed racer to show off the Snapdragon 855’s gaming chops. Trying to hold a video or audio call through wind and rain can make communication impossible. The Snapdragon 855 has an interesting feature that allows it to intelligently filter out music you’re playing back and record just your voice instead. The Spectra 850 digital signal processor (DSP) is powerful enough to enable a number of different features, not the least of which is richer, more dynamic 4K recording with HDR. Qualcomm executives made the argument that the new enhancements to the Adreno GPU, together with the improvements in the Spectra DSP, would make video viewing more preferable on a smartphone than a laptop or computer monitor. Note: I realized later that I never actually began recording on the phone, although the video shows the pre-recorded video captured with the Snapdragon 855 reference design. We also recorded a couple of still images. Simulating bokeh, the dramatic contrast between out-of-focus areas of a photo and the subject, has been a feature of “portrait modes” over the last few years. 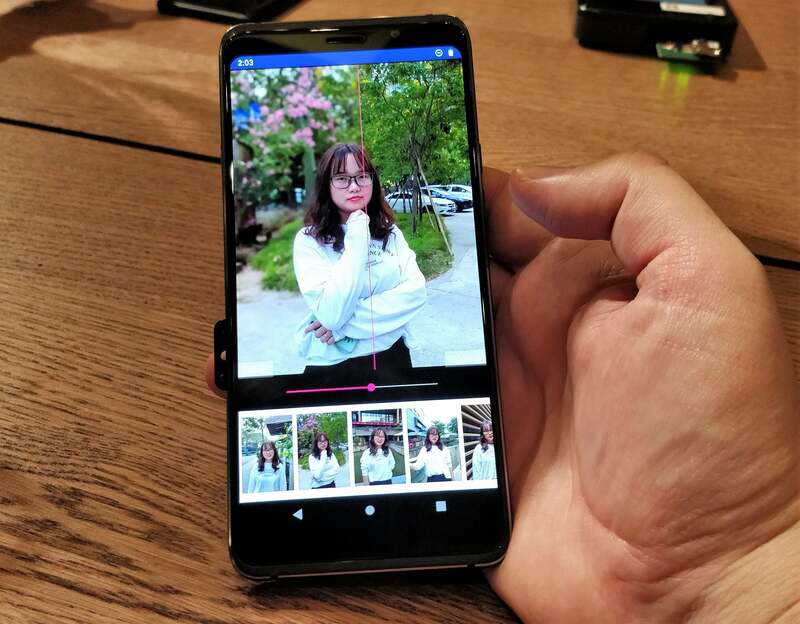 It’s not clear whether this is just a demo or some sort of feature that smartphone makers will be able to add, but it shows just how easily the Snapdragon 855 can add it to a scene. Notice the bokeh effects to the left, blurring out the background, while the cars to the right remain sharp. Click the image to enlarge it and see great detail. 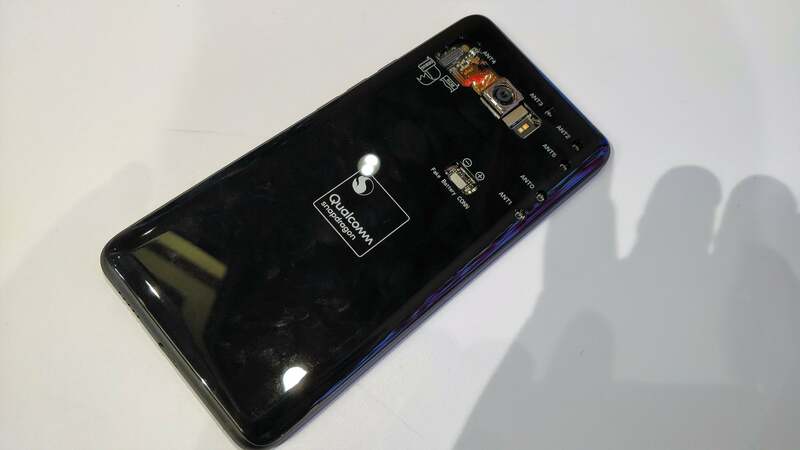 Finally, here’s a closer look at the back of the Qualcomm Snapdragon 855 reference phone itself. The touch points for the antennas are used for diagnostics.